Bank of England to release its Consumer Inflation Expectations for the upcoming 12 months. Rumors about Brexit alternatives underpinned Sterling at the end of the day. 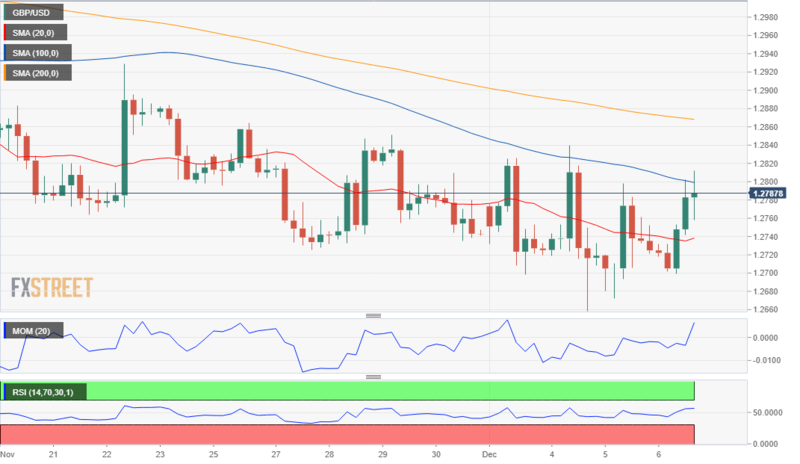 The GBP/USD pair hit a daily high of 1.2811 amid broad dollar's weakness and with Brexit concerns being put aside ahead of the key Parliamentary vote that will take place next Tuesday. Still, the Pound got an intraday short-lived boost on some rumors making the rounds about the UK Cabinet having discussed the possibility of a second referendum or a softer Brexit if May's plan doesn't pass the Parliament, although the talks had no solid base and the spike was quickly reversed. The US currency came under strong selling pressure ahead of the American opening following a batch of softer-than-expected employment data which hints a soft Nonfarm Payroll report this Friday, maintaining its weak tone throughout the session. This Friday, the Bank of England will release its Consumer Inflation Expectations for the upcoming 12 months, previously at 3.0%. Nevertheless, the market's reaction to the release is expected to be limited, with the focus on US employment data and risk-related factors. The GBP/USD pair trades above the daily ascendant trend line coming from November monthly high, but still below its weekly high of 1.2839, with a modestly positive tone in the 4 hours chart, as it has also advanced above its 20 SMA. The Momentum continues hovering around its mid-line, while the RSI stabilized around 57 indicating that buying interest is not strong enough at the time being. Beyond the mentioned weekly high, the next strong static resistance comes at 1.2880, the 61.8% retracement of 2016/18 rally.